Memorial Day is later on this month but it has impact to our family in a more deeper sense. I felt the need to write about it now. My father’s brother, Adam Leddy, was on that airplane that is mentioned in the post below. You can read the particulars of the incident. I remember the impact to my grandparents, John and Maria Leddy, and all those years of holding out hope that somehow their son was still alive. There were stories that he was captured by enemy hands and held prisoner or that he was on some secret mission. There were many rumors and false hopes. When someone is listed as missing in action, there is no closure. Even when the time has passed and that person is declared dead, there was really no real end of this incident for my grandparents. I never knew my Uncle but I knew his children. Linda, Adam, and John lost their dad. I cannot imagine what that must have been like that for them. I think for the younger ones he must simply be a hazy memory and that it is more a yearning for the knowledge of what could have been for them. This incident impacted so many lives and families. This “mystery” incident will continue its ripple effect every time a descendant or loved one wonders what happened and no answers are given. Uncle Adam, you will not be forgotten. You are our family hero. The following article is copied directly from the Lorain County Photographer’s Blog. The flight arrived at Guam at 11:14 GMT with the only irregularities on the way being minor maintenance on the ignition systems of engines #1 and #3 at Honolulu, a 30 minute delay at Honolulu because of stewardess complaints of inadequate rest facilities aboard, and minor maintenace at Wake Island (discrepancies in the #’s 1 and 3 engine ignition systems). The flight departed Guam at 12:57 GMT for an IFR flight to Clark AFB, Philippine Islands with an ETA of 19:16 GMT. This plane, a Lockheed Super Constellation, had a flight crew of 11, and 96 U.S. soldiers, including 3 South Vietnam enlisted men. The Department of Defense has “excluded this flight,” from it’s own criteria, which would enable these 107 names being included on the Vietnam Veteran’s Memorial (The WALL) in Washington, D.C. Above are the names of the troops that were on the plane, with the soldiers from Ohio in boldface. These men have been denied their rightful place of honor on the wall. This website was set up by the daughter of George Michael Nau, a US Navy and Civilian Flight Engineer, who was one of the 107 that disappeared. There are two men whose names are not in the list above. Two soldiers who weren’t able to make that flight. One of those soldiers was Lorainite Dan Asensio. Due to problems with their passports, he and another soldier were held up and were unable to accompany their fellow soldiers when they departed Travis Air Force Base. All aboard this plane are not officially listed as Killed In Action, Missing In Action or Prisoners Of War by the Department of Defense. I won’t claim to know why the government is denying these men their rightful place on the Memorial Wall in Washington, D.C., but I do want to point out two facts: The plane disappeared on March 16, 1962. According to another website, the first U.S. troops entered Vietnam in March 1965. Three years difference, between when the Lockheed was supposed to land, and the ‘official’ entrance of U.S. troops into this conflict. What was the proposed mission of these men? Had they actually completed their journey, could there have been a difference in the outcome of the war? We’ll never know, but I do think that the government should rethink their position on recognizing these soldiers. On this Memorial Day, 2008, please take a moment to say a prayer of ‘Thanks’ for all the soldiers who have fought for our Country. Say a prayer for all of our soldiers deployed throughout the world, to keep them out of harm’s way, so that we can continue to enjoy the freedoms that we have. And if you’re lucky enough to come face-to-face with one of our Country’s finest, take a second and thank them personally, for their dedication and effort. We ALL truly appreciate it. My sympathies to you and your family on the loss of Adam Leddy, and the lack of closure involved concerning his whereabouts. I’m happy to see that you felt the article was worth reprinting, and I appreciate the linkback. My best to you and yours. Thank you for making sure these souls were not forgotten. On behalf of my three girls, and how how this means, thank you and all the cousins for keeping Family so close. You are welcome. It is a privilege. I can’t believe I found this site. My father, Sargent Lindsay K Hester was on the plane that day too. Unfortunately, I was not born until five months later. Growing up I was given a somewhat abbreviated accounting of the events. This is the first thing in print I’ve ever seen. I never knew what to think. There was the whole Bermuda triangle theory in the 70’s, and at least a dozen other scenerios. In the early 90s I tried to use the internet to search for anything and found nothing. I didn’t try again until now. Thank God for Google. If there is any thing else, any details at all, please forward. I am glad you were able to find this information. My wife’s father Lindsey Hester was lost on that day before she was born. Today she found this story. It is one of very few records she has been able to uncover about her father. I want thank any and all that are responsible for this information. I think this will allow her some closure. This has been a shadow in the back of her mind forever. Thanks so much. I am so glad this has helped your wife. God bless. I realize that the names of these men were never placed on the Vietnam Wall, but I will never understand why not? I remember back in 1962 how Jack Packards family were waiting and praying for word on their son Jack. They have not to this day received even a Purple Heart or had his name added to The Wall. 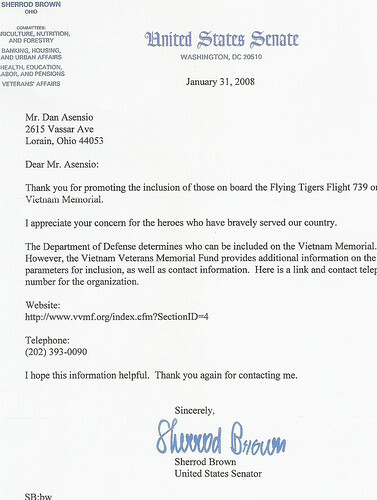 I am going to pursue the issue of the Purple Heart for all of the servicemen on flight 739. I will start a fund raising campaign on March 16, 2010 for funds to be able to purchase 96 Purple Hearts at a cost of $36.00 each from a private concern. I will then send a letter with this award to the next of kin to show that we as private citizens (not the US Government), appreciate their son giving the ultimate sacrifice being his life to help preserve our way of life in the United States of America. Jack has an older brother who was a Marine at the time Jacks plane dissappeared. His name and telephone number is listed below. Thank you for this information. I know many of us want to be involved in this same effort. until we landed in Sagion.Nobody there knew anything about the plane. I still wonder why no evidence was found. My father was on that plane. My mother was 3 months pregnant with me at the time. The name is mispelled above: He is Edward DONALD Cox; not Douglas. Please correct this in your next article or in the website. Yes, it is the not knowing that really hurts. I have actually been in contct with Mrs. Nau. I found her about 10 years ago and we exchanged stories. Thank you for sharing, Caroline. I will see what I can do about the corrections. I have changed Mr. Cox’s middle name on my blog. My sympathies to all who lost family. I cannot begin to imagine the pain of not knowing, nor the brush-off that the government has given this matter. I will be forwarding the link to this article and mine to some folks, and I will let you know if I get any replies. Thank you so much. My family as well as others who have loved ones that were on that plane will be forever grateful for your efforts. I made the change too. JP – I am a Vietnam researcher (and vet) working on various projects regarding the war – one of them doing extensive research into this crash. I noticed that your uncle was onboard. Does he have any immediate family around that I can contact – I would like to get some possible key information that may be helpful in this mystery. He does. Let me contact them and see if it will be alright to pass their information to you. Thank you, Robert. I hope we can hear more about this incident. In March 1962 I was Stationed in Guam, I was 19 years old. I was Stationed at Anderson Air Force Base. I was just an Airman at the time but when they asked for volunteers to go on the search Planes I did. We searched for a long period of time . When flying and looking down into the Pacific Ocean we were the spotters trying to find anything, any object that may resemble a plane or persons who may have survived. We did not find anything at all and to this day March 5th, 2010 I still have not forgotten what had happened and all the people lost. I do hope that some day that all will be Honored and put on the Vietnam Wall in Washington D.C. After almost 50 Years I have not forgotten that Time. Thank you for your moving comments. I hope for the same. DAN ASENSIO: Can you please connect with me at bruceswander@hotmail.com. I have been researching this incident for over 10 yrs now and you (may) have some key information for me. Was in the Army myself when this happen. My half brother Billy W, Mick was on the flight. I was in basic training in Ft. Ord Calif when received word from my Dad that the plane had crash. My mother had just passed away the year before and it was the last time we had seen our brother. Just hope the Government will do something for these brave soldiers who died for our country. I have a somewhat personal connection to Flight 739. On March 15, 1962, when I was 13 years old, my family and I were waiting to fly out of Guam back to the States to visit my grandfather. At the terminal while we waiting to board our flight, Flight 739 land and taxied up and stop directly behind our plane. I remember the soldiers disembarking from their plane and entering the terminal. They were so glad to be off the plane after a long flight and able to stretch their legs. Most were joking and laughing with each other. One of the soldiers, an Asia-American, who I now believe was James Wong, bought me a coke. After a little while, the soldiers watched us as we boarded our plane and took off on our flight to Hawaii. When we landed at Honolulu, my dad told us that Flight 739 had vanished a short while after it left Guam. This made quite an impression on a 13 year old youngster. I learned that one minute you can be so alive and vibrant and the next minute you’re gone. To this day, I have never forgotten the soldiers and can still see them coming into the terminal building on Guam, forever young and alive. Thank you for sharing. What a powerful memory that resonates so much now. 20 mths old at the time of the flight. My mother fought and fought with the government to have my dad interned in Arlington. Finally happened in July of 1996, but they would only put his Korea tenure on gravesite. We were actually in Guam when the flight left for Saigon. My Mom tells me that we were actually able to go to the airport and be with my Dad until they were called to reboard, and he gave us each a kiss and a hug. This article and the questions I have been able to ask my Mom now – help clear up the lack of information I always thought I should have had. Saigon should be added to the wall. Its a shame that some technicallty in wording keeps them from being honored as they should be. My dear cousin, thank you for your comments concerning your father and my uncle. Much still has to be done to honor these heroes appropriately. I also miss my brother Billy W. Mick as my two brothers have voice elsewhere in these comments. My brother Joe was the one who mentioned that our mother had passed away the year before. That’s where I am a little different than my two brothers, when our mother passed away my dad was not able to take care of me being the youngest so I was sent to live with Billy and go to school in Sierra Vista, Arizona where he was stationed. I was there for a few months when he told me one day that he had to take me back and I thought I had done something wrong but he told me they were sending him somewhere else for a little while and when he got back he would come get me. So you can see my brother was fresh in my eyes and mind when we lost him. I went to Vietnam in 1967 after all and came home in 1969 a very changed and altered man. I go on google earth all the time and got about an hour and a half from Guam and peer at the water for a long time thinking maybe I can see thorugh the water and see my brother and it trouble me to this day that I cannot. Someday perhaps I will see him again. I truly wish that Washington would get off their asses and see these men deserve to be on that wall just as much as all our other brothers and sisters that we lost in a war far away that most of us still don’t understand. Thanks for giving me a site to express my mind such as what I have left. Thank you everyone for your kind thoughts. Thank you for your moving and insightful comments. I hope your your wishes for recognition for these men will come to pass. I am a retired army sargent . I was serving when my half brother Billy W. Mick’s plane went missing . It really broke my heart to know I would never see my brother again . I was very young when he left home to serve our nation . I like to think it was he that inspired me to make the army my life . I miss him very much like my 3 other brothers that have listed on this post . Thank you very much for this article . My brother was on this plane. Spec. 4 Leonard Wedge. 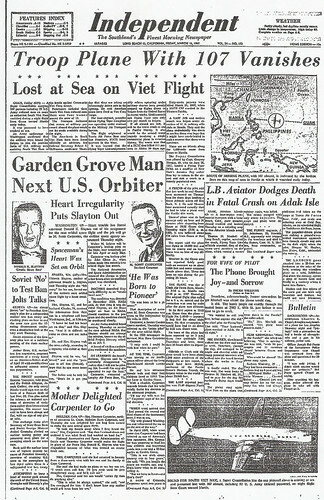 March 16th will make 49 years since the plane vanished! Not a day goes by that I don’t think of my brother. I have been trying for many years to have these men added to the Vietnam Memorial Wall in Washington. The U.S. Army REFUSE to add them! Why? I have talked to Jan Scruggs, whom I was told was behind making the wall…..he also REFUSED me! WHY? I will probably never know but I will keep trying!!! My sympathies to your family and hopes that soon the honor and recognition your family deserves will come soon. I hope one day these brave soldiers get the official recognition they deserve. I live in Leonard Wedge’s hometown and know some of his siblings. The families all deserve answers to their questions, too. Best of luck to all of you. My Uncle Leonard Wedge was on this plane, I never got to meet him but his memory lives on by those who love him dearly…..
Willie, I have not forgot your Dad, I thank him often for serving our country a real hero, March 16 th 1962, I will remember him and all his family has been through. leonard Wedge was my brother i still have his mia braclet. I will have it until the day I die. I spent 4 years in the navy and was told I would not be sent to vietnam because I lost my brother there. so something is beeningheld back from us about what went on in 1962. i will carryhis picture with me until the day I die. Leonard Wedge is my great uncle. I hope that the U.S. Army will find it in their hearts to put his name on the wall in which he and many others so rightfully deserve. It would be nice to find out what happened to the 107 soldiers who were on this plane. One of them is my Uncle Leonard Wedge. I never had a chance to meet him. He was the first born son of my Grandparents and they are now passed and never had any closure on this. They thought he could walk through the door at any moment. The names of these men need to be on the wall. It is the very least the government can do after stealing these men away from their families then acting as if nothing happened! i hope you will all find the answers you need.we must never forget any of them. My cousin Leonard Wedge was on this plane. My thoughts are with all of the families on the anniversay of this tragedy. My brother lost his dad 49 years ago. I never met him, but heard he was a pretty terrific man. My thoughts are with you Lennie Wedge from Millinocket, Maine. I give my greatest sympathy to all who lost someone during this time. I pray that one day someone will find out the answers to all your questions and provide some closure. This is for my dear friend Sara, I hope one day you find out what happened to your brother. Also my deepest sympathy to those who the government will not honor on the Vietnam Memorial, may they finally be recognized. I would be willing to meet in Washington next year if someone wants to arrange something! Thank you all for submitting your comments again on this post. Today we remember theses heroes. Among them, my Uncle Adam Leddy. His children, Linda, Adam, John and his grandchildren and also his widow Elsie still deserve to see that, he, along with the others who were lost are given the recognition they deserve. Besides efforts in Washington, I would suggest writing into National Media outlets to make them aware of this story. I even wrote into the Oprah show. Perhaps show efforts would spark some attention. The time has to be now. Leonard was my uncle and Godfather. I did meet him, but only as an infant a few weeks old. At least I have a few pictures, but more important like to think I know him through his son Will and wife Suzanne who are beautiful people. Prayers always go out to all these families, and hope for all for their place on the wall. Thinking about my family today! I have only heard stories from my grandparents and my mom about my uncle Leonard who was on this flight. Cannot imagine what they must have went through! These men are not forgotten! Well, it’s Memorial Day coming and still nothing out of Washington. I guess it’s pretty much true be they Repulicans or Democrats, they send us all off to war and when we come back they are pretty much done with us. Oh they do their little dances and have their holidays that they create but you see that doesn’t cost anything, it just gives them an additional day off from doing the gbusiness of the Corporate Government. you see the Government is not The Peoples government anymore, it belongs to the rich corporations and their CEO’s, has for a long time now since Kennedy I suppose, but then many do not agree with and that’s their right. they just don’t seem to believe that I have a right to say what i want. But what to do? I have read all the above responses, they are the very same questions we had as a family when my uncle Franklin D McClure vanished into thin air. i remember everything leading up to his departure. Franklin was my father’s only brother and they were very close. I will never forget the day we got the news that he was missing. my father and grandparents died waiting for him to walk thru the door. i would love to talk to someone about this event in their lives to see if we have anything in common. My uncle Joseph F.Broome was on flight 739,thank you for sharing this story. Thank you for this website. My older brother, Larry Canon, was on this flight. Prior to taking off the first time, he called home and told us that they had told the men to call home now if they wanted as they were leaving shortly. Larry just had time to say goodby as he told us “They’re lined up knee deep behind me to use the phone.” That was the last we spoke with him. He sent a post card to us from Hawaii and one to a friend from Guam. This month he turned 69. There have been many unusual things surrounding this plane and incident, and many conflicting “explanations”. We, too, as a family, have been highly impacted. My mother and father both have died with no closure. It has been quite empty at times. And ugly. Thank you so very much for posting this site. It’s been such a heartfelt and surprisingly uplifting time I’ve spent reading the article and each and every response. I wish I had found it years ago, but had quit searching. My father was on that plane, Sgt. Billy W. Mick. I was 5. My newly found uncles have already expressed how difficult it was for them, but I won’t even begin to explain what it was like for my mother, my brother, and myself. These soldiers should be on the wall, but they should also have received a decent burial service and the widows should have received a flag. That’s been my biggest disappointment with it all, the sadness of my mother that her husband gave his life for his country and this county wouldn’t acknowledge it with a decent memorial service. They owe us one. Thank you, Uncle Don for sending me the article. We all loved him. Condolences to all who lost loved ones on that flight. Thank you for creating this web-page and thoughtful comments. I’ve visited this site several times over the past few months and thought it was time to make my contribution. I was almost 12 years old living on Wake Island where my dad was in management for Pan Am. We were close friends with Chris Reiter (Christel Reiter, Stewardess, Flying Tiger Line Flight # 739 on 3/16/62). Chris had layovers on Wake and was my water skiing buddy who taught me to go from two to one ski. When I had bullying problems at school she gave me advice which I later used in life (martial arts, starting defensive end at the University of Hawaii, commercial pilot,MBA, great wife and kids). When the plane was lost we were devistated. My dad who was head of maintenance knew the aircraft well. He said the only thing he could figure was an explosive device. We talked about it over the years and it reminded him of the Pan Am missing flight between Guam and Manila in 1938. All the best to all the relatives and friends of Flying Tigers 739, they’re not forgotten. I had the honor of setting up one of the 5 Vietnam Memorial Traveling walls these past few weeks and could not help but think about my brother Billy Mick whose name i think along with those lost with him should be on this wall. There are names of those who had fallen in 1959 on that wall, so we know the advisors going there should be there as well. As a member of the Vietnam Veterans of America I will push this as hard as i can. My brother John Charles Jennings(Corky) was on that plane and I have never been able to understand why all on that plane were not able to be on the wall. We were told that they were not on active duty and fighting and that was the reason they were all omitted. We had a neighbor in WV who fought for 10 years to get Corky’s name on the Vietnam Veterans Memorial in Charleston. I have a picture of my mother taken pointing to his name on the Memorial. He graduated in May of 1961, turned 18 in January and was gone in March. Tomorrow Jan. the 10th would have been his 68th birthday. Happy Birthday Corky, we love you. 1. Anyone who dies – regardless of cause – on foreign soil within South Vietnam, North Vietnam, Laos, Cambodia. This also includes boundaries that stretch a few miles out into the South China Sea that are designated war-zone. Note the word ‘few’. 2. Deaths that occur outside of the war-zone area, but are attributable to events that occurred there. These are usually individuals evacuted out due to wounds, illnesses, accidents, etc – and subsequently died shortly thereafter. 3. Individuals that died while “going to, or returning from” a specific war-related MISSION. This change was made primarily for Pilots/Crew who crashed after a NVN bombing raid in Thailand…which is outside of the war-zone boundaries established. Based on various documents, no argument can be made that this crash occurred within the few miles of SVN…no flotsam was ever found. However, a theoretical argument could be made that these soldiers were ‘going to’ SVN on a specific war-related mission (as opposed to being new replacements). The CAB report done does reference that they were Communications Specialists – a group being sent there for a critical purpose of the war. The problem is that of all of the Personnel Files obtained (about 35 so far) – ALL have been excised of any training received prior to this crash. Without those records, I cannot determine in what communications genre they were trained in, what Army or MACV Unit they were to be assigned to once there, or the specific reason/mission they were to perform. If anyone has any knowledge or documentation as to where their relative was stationed at for training – or what they were trained in, please email me at bruceswander@hotmail.com for further research. Thank you so much for this website. My dad was Sgt. Warren M. Lehmkuhl who was a ham radio specialist. As a child of 8 years, I remembered a party that was held at our house one week before deployment. I met about 20-25 men with their wives or girlfriends and got to experience their laughter with plenty of good food. They were very excited about the “mission” and were all packed and ready to leave. These wonderful guys introduced their buddies, wives, and girlfriends all around just as if they were having a college reunion. Showing pictures of their kids, moms, dads, and siblings to everyone, even us 8 kids relating stories which created more laughter. It was an honor to meet them and these memories are so precious. I want to thank all of those folks from Fort Benning, Ga who helped our mom (Betty Lehmkuhl) during this crisis. Did you know, March 16, 1962 fell on a Friday. March 16, 2012 also falls on a Friday. 1:30 AM Friday the 16th will mark 50 years since a merchant ship witnessed a bright flash in the sky where the missing aircraft was on course between Guam and Clark AF Base in the Philippines. 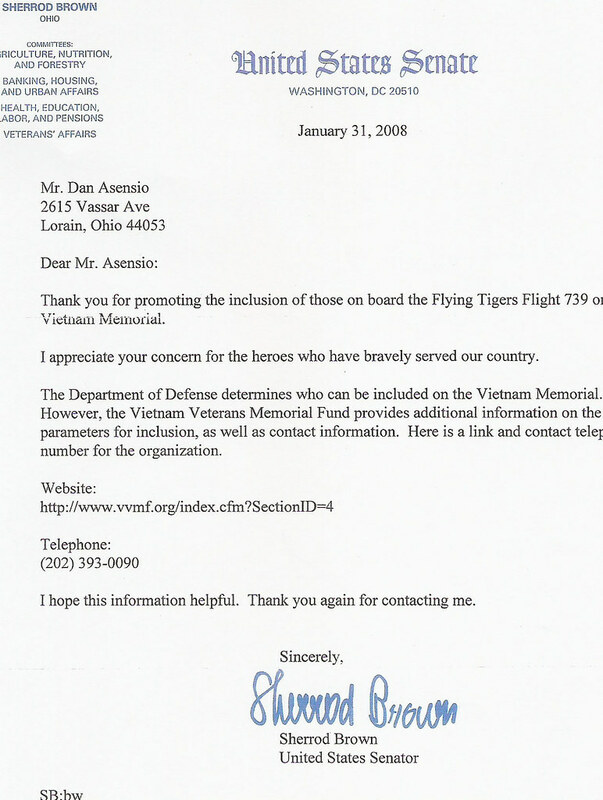 I have sent email to the Vietnam Memorial asking for criteria for inclusion. When I have a reply, I will let everyone here know what it is. My father Warren M Lehmkuhl was on that plane and should be on the Memorial. The Vietnam Veterans Memorial Fund receives numerous requests each year from individuals who desire to have particular names placed on the Memorial. While the Memorial Fund finances the name additions to The Wall, we do not determine whose names are to be inscribed. It is the Department of Defense that makes these difficult and often very technical decisions. Our organization does not have the authority to overrule those who adjudicate these matters. Neither victims of Agent Orange nor PTSD-induced suicides fit the parameters for inclusion on The Wall. (Click here for a brief summary of the criteria and sources for names inscribed on the Vietnam Veterans Memorial). We are often asked to add a name that DOD has not approved. Much emotion has surrounded the question of names not included on the list. 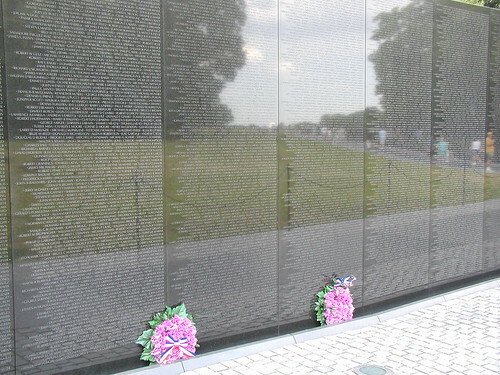 Many families whose sons were taken from them in service during the Vietnam era but in other areas, as well as those whose loved ones died consequent to their return from the war (casualties of Agent Orange or PTSD-induced suicide), have expressed great disappointment that their loves ones’ name was not on the Memorial. Such cases have our deepest sympathy and respect, yet as they do not fit the parameters as described above, these names cannot be added to the Memorial. However, The Memorial Fund honors those who have died as a result of the Vietnam War, but do not meet the requirements for inclusion on The Wall with its In Memory program. There is a plaque by the wall to honor these individuals as well as a ceremony to remember them. Honor Roll books listing all of the names honored by the plaque are available to those who participate in the program. Call us at 202-393-0090 to learn about the In Memory program. http://vvmf.org/137.cfm link mentioned in last comment. Thank you, Jimmy for your efforts. I only can tell you what my mother has told me. Mom Betty Lehmkuhl, has always said that he went on a mission related to setting up the communication lines related to possible events that could happen in the region at the time in 1962. I do recall reading the official transcripts about the flight from what I believe was the DOD or the courts from the Law suit. Thank you Shirley and Jimmy . I was only two months old, so I did not really have a chance to know my father Warren M. Lehmkuhl. I have retired from the Navy and flown that path to get back home from the Indian ocean. I could not imagine doing it on a plane like the one my father was on MAR 16, 1962. My heart goes out to all of the family members of the flight and all of the brave men and women have served. We should always remember them and ensure we give thanks to those who have served and are serving today. To find out the details of this mission you have to access classified documents related to the cold war and an effort to establish a clear line of communications with our executive branch (RED PHONE), I wish I could have known the code name and which Chief of Staff made the orders for the mission then we would be able to find the documents. I believe this was the mission. I am fairly sure the mission was a Presidential Executive Order and could be found in his memo’s. I just want every one to know my family and I were just talking about this, because my son is about to have his first child tonight and I was just thinking about the irony of the possibility that she would give birth on this anniversary. I will never forget and I will make sure my family does not either. Thanks for sharing this , Timothy. I hope this effort will result giving these heroes the honor they deserve. Timothy – can you email me at: bruceswander@hotmail.com I have been researching this incident for some years now and have a couple of questions for you. My grandfather, William Reeves Jarvis, was on that tragic flight. I was always told he was killed in Vietnam with no details from my family, up to now (power of Facebook). My father passed away 12 years ago and we never really talked about his dad or the circumstances surrounding his death. I don’t need closure, but I think it’s important for me to tell this story to my children. Thank you to all that have commented on this event. Please keep me in the loop for any support needed to honor these brave soldiers on the Vietnam War Memorial. Thanks for your comment and keeping the memory of these heroes alive. That is beautiful, Will These are heroes. Anything we can do to remember them is important. My younger brother and I have been reading your posts on this, the 50th year after the disappearance of my older brother, Larry Canon’s N6921C flight. In many ways it has been only a short time ago in my life. Thoughts and reminders of that time are with us daily, as well as the unanswered questions. Someone mentioned the Liberian tanker and their report of the “the “explosion”. We have obtained the original statements by those aboard the tanker and they testified that there was no explosion, but, rather, they saw something “like a flare from the surface” and then, what they described as parachute flares falling from the sky. The explanation of an explosion we were given was absolutely denied by these witnesses. So the questions remain after fifty years. All communications down, conflicting reports and hundreds of redacated documents. Yes, we have always felt that it would not be a suprise for my brother to walk through the front door. We don’t need to know what has happened during this time. Deep things are often declassified at the 50 year mark, if not before. It is time, don’t you think? Our family wants the resolution of clearing up the mess of confusions and untruths. We are all certainly deserving of that much. My family extends our empathy to all of those others who, through no fault of their own have been on a fifty year trip down this rabbit’s hole with us. Our prayers are, as they have been for 50 years, with those on the flight and their families and friends. We will never forget. Thanks for your comments. I wish we can have some of these items declassified. There is a lot of confusion around the actual circumstances of this event. These heroes and their families deserve a legacy of truth and remembrance. Thanks, Tammy for your comments. Thank you for sharing this special event. Thank you to ALL the soldiers on this Memorial Day 2012!!! My aunt lost her husband on this flight. His name was James E Lattie. I would love to be able to help her find some closure and finally know the truth. We collectively miss you dad and all these heroes. So glad to have found this site…Thank you so much! My father, Sgt. David Lucious Croft was also on of the men on the plane. I was 5 years old. I remember very little about him. I also know nothing about his side of the family. I have searched for years trying to find out any information about my father & his side of the family, only to come up blank. So again, I thank you so much for this site. It did give me more info about the flight, than I was aware of. Frank – can you email me at: bruceswander@hotmail.com I have been working on this incident for some years now, and have a couple of questions regarding your wife’s uncle. a great deal of work? I’ve very little understanding of computer programming however I was hoping to start my own blog soon. Anyhow, if you have any recommendations or techniques for new blog owners please share. I know this is off topic however I just had to ask. Appreciate it! Another year has come and gone!!! No closer to being added to the wall!!! My thoughts and prayers go out to all family and friends of those lost on this flight. Keep up the fight to get these heroes recognized in the manner they deserve. On Dec. 5th, my uncle Spec. Leonard Wedge would be 75. Happy Birthday Uncle! I have just finished reading the comments on this site and am so thankful for what you are doing and have done. I was supposed to be part of that group. I was a combat motion picture photographer MOS 841.20, stationed at the Army Pictorial Center in Long Island City New York. In 1962 the Army Pictorial Center celebrated its 20th Anniversary. Sgt Twitty and Sgt Croft were my friends and fellow soldiers. and were on flight 739. Sgt Twitty was supposed to be the director, Sgt Croft was slated as the Motion Picture Cameraman and I was supposed to go along as the assistant cameraman on a three man crew. Thanks for your response. Our group is trying to understand it also. My brother was on that flight. Wonder why no media has picked up on the real similarities? I thought about it first thing…no one should be left hanging for 52 years. That flight is still carried as “Vanished” on the records. It is the only one that has that designation. I pray for the families and friends that share our lack of closure. 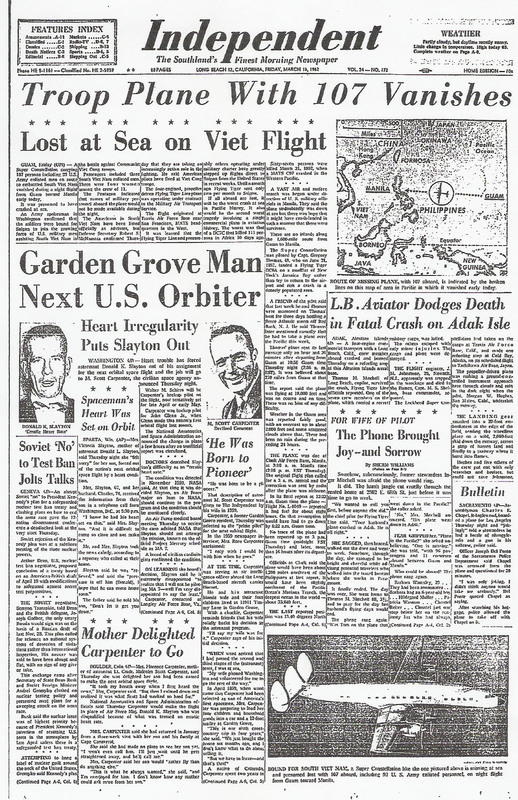 This Sunday March 16th will be 52 years since the plane disappeared. It is not far from where the plane in Malaysia has disappeared. Too similar. It is obvious, to me at least, given the parameters for being added to the wall…that IF the Army admitted to this mission THREE years before the actual inclusion of the United States into the Vietnam, a huge can of worms would be opened and many questions would have to be answered. It was obviously a covert mission and the govt. doesn’t want to admit to it. I actually got my dad’s military record years ago and it doesn’t even show that he had RE-enlisted, after many years in the service of his country …for the purpose of serving his country again…I was 12 when he died.